The number of jobs being advertised in New Zealand is on the rise, according to the Seek New Job Ad Index, which shows a 6.4 per cent year-on-year increase. 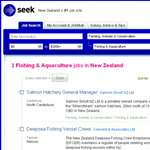 Seek general manager Janet Faulding says the rise in job ads was nationwide. The most solid growth continues to come from the Canterbury region where jobs advertisements rose by 4.6 per cent in May and are now a third higher than a year earlier. But the latest data out today also shows rises in the two largest markets – Auckland and Wellington. Job ads in Auckland show a 3.9 per cent rise on last month while advertised roles in Wellington grew 2 per cent over the same period, and are now 7.9 per cent higher than in May the previous year. Faulding attributed the May rise in job numbers to the strengthening housing market and building activity picking up, which are beneficial to the economy as a whole. “This will likely be reinforced as reconstruction activity in Canterbury increases throughout the year,” she said. The mounting strength in the labour market comes despite an underlying air of financial uncertainty both locally and globally.